SO Pretty!!!! Love the way you added the glitter to her dress and that image is totally precious! Also love that great die! This is totally fabulous! 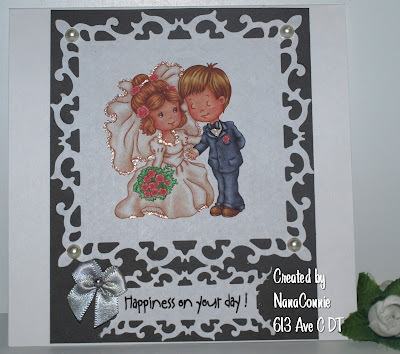 Love the die cuts you have used!!! Gorgeous, NC. Looks like another winner! So sweet and pretty, Connie. That glitter ink worked so well on that gown and veil. Wonderful die, too. Ooooh, what a sweet image and you colored it so well. Great job with adjusting the die to make it work!!! I love my Spellbinders! I think the glitter adds such a special touch. Lovely!! Beautiful my friend, love the cute image and as always a fabulously coloured image. Thank you for all your lovely comments today. Awwww - how sweet they are! I love your glitter placement on the bride! So pretty! Awe, so darn cute and sweet, fabulous and the embellies are rockin this beauty. Such a cute image & I love your die too! What a great wedding card thanks for joining us at OBAG this fortnight and good luck! 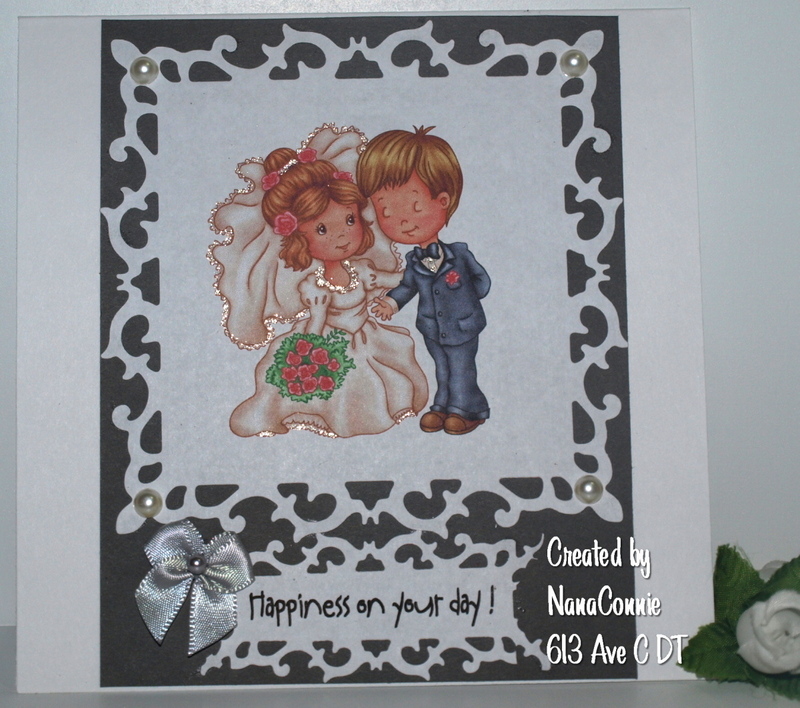 Beautiful wedding card, I love the colouring and the wonderful die cut frame! What cuties, and I really like the frame form the die-cut. Thanks for joining us at Shopping Our Stash! Thanks for joining us at DTBS at Sassy Studio and I hope we see you again soon! Gorgeous card! Love the Die! Thank you for joining our DTBST Challenge this week. This is adorable, thanks for playing with us at Catch The Bug. What a wonderful card! Thanks so much for playing along with our Them challenge at Catch the bug! Oh how cute! Thanks so much for joining us at Bugaboo's Catch the Bug blog this week, good luck in the draw!